ORNL associate laboratory director for Nuclear Science and Engineering Alan Icenhour, ORNL Director Thomas Zacharia, Department of Energy ORNL Site Office Manager Johnny Moore and ORNL’s Emory Collins celebrate at an event designating the Radiochemical Engineering Development Center at ORNL as an American Nuclear Society Nuclear Historic Landmark. 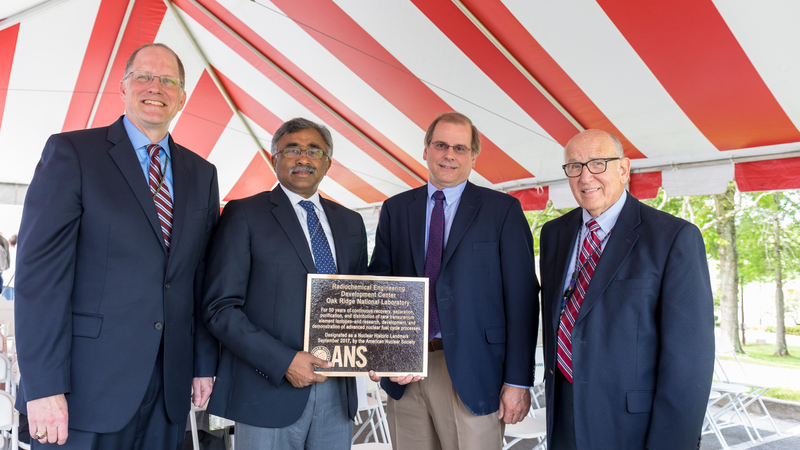 OAK RIDGE, Tenn., May 16, 2018—The American Nuclear Society has designated the Radiochemical Engineering Development Center at the Department of Energy’s Oak Ridge National Laboratory an ANS Nuclear Historic Landmark, recognizing more than 50 years of isotope production and nuclear fuel cycle research. The designation by the American Nuclear Society identifies and memorializes sites or facilities whose outstanding physical accomplishments were instrumental in the advancement and implementation of nuclear technology and the peaceful uses of nuclear energy. 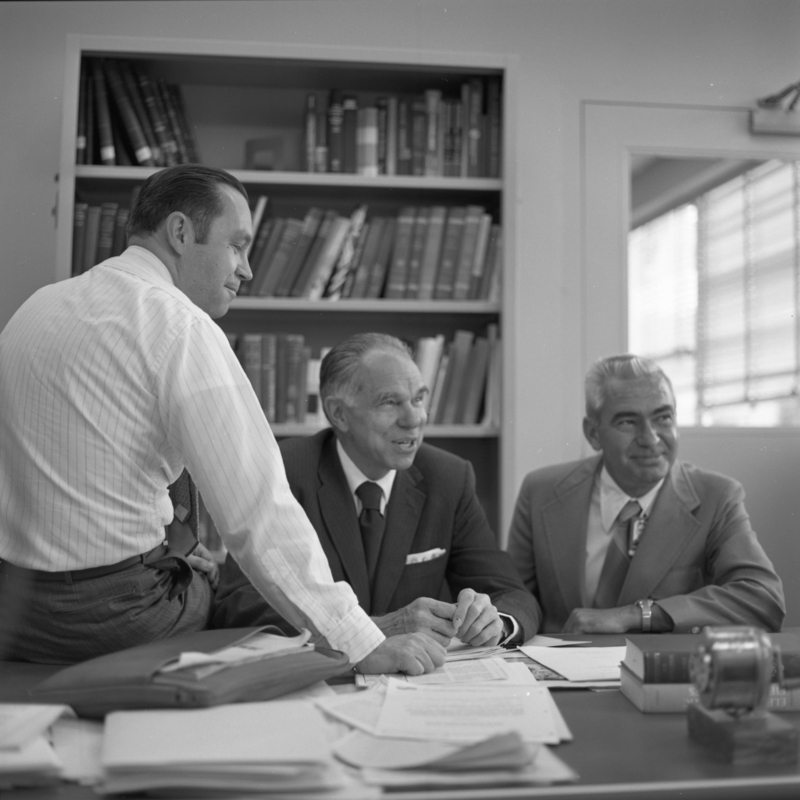 Seaborg’s “vision” has been fulfilled and expanded through 77 REDC production campaigns conducted to date. The facility fabricates targets of neptunium, plutonium, americium and curium for irradiation in HFIR and then processes those irradiated targets to separate, purify and distribute the transuranium element isotopes for research and industrial use. 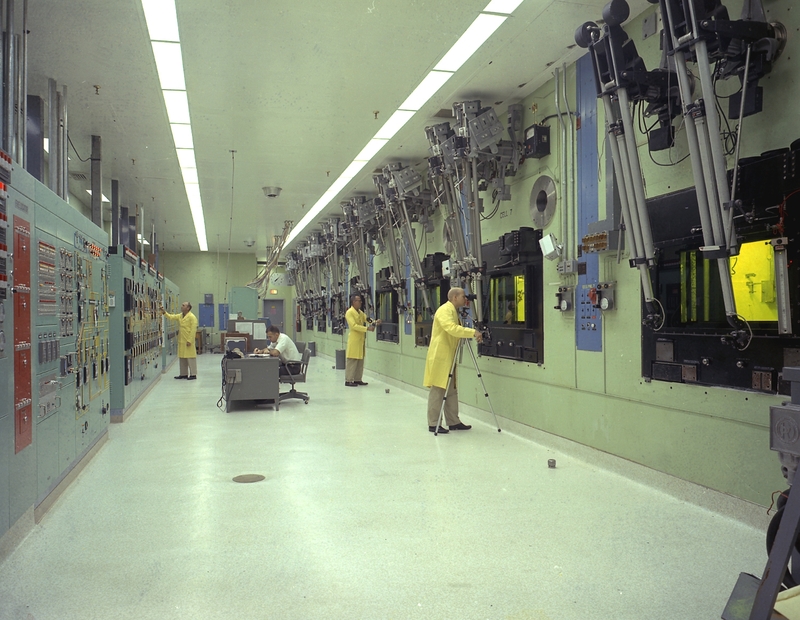 In 1967, the REDC complex added a building as a thorium–uranium-233 recycle facility, and the building’s function later shifted to purification and distribution of californium-252. With a variety of hot cells, glove boxes and laboratories, REDC is used to perform research and development in areas such as energy, medicine, national security and space exploration. One current effort focuses on producing plutonium-238 for use in NASA’s future deep space missions, with the goal of full-scale production by 2025. A long-standing mission of REDC has been the production of californium-252—a portable neutron source used in industry and for national security applications. ORNL is the only production site of Cf-252 in the western world. 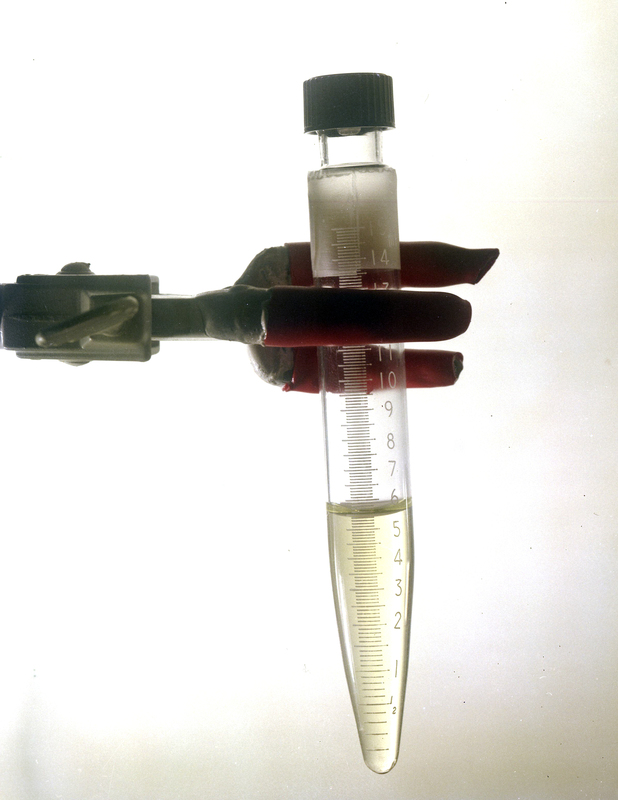 In addition, REDC was critical in the production of berkelium-249 used in the physics experiments that resulted in the discovery of element 117, tennessine. REDC’s unique design conveniently provides the ability to add and replace specialized modular equipment. This design not only has been valuable in isotope production but also has enabled REDC to serve the nation through research, development and demonstration of advanced nuclear fuel cycle processes for DOE’s Office of Nuclear Energy. This capability enabled the facility to process irradiated fuels from commercial nuclear reactors and the Fast Flux Test Facility, a liquid metal fast breeder reactor, making REDC a vital component of the Consolidated Fuel Recycle Program, the Advanced Fuel Cycle Initiative, the Global Nuclear Energy Partnership and the Fuel Cycle Technologies program over the last 40 years. 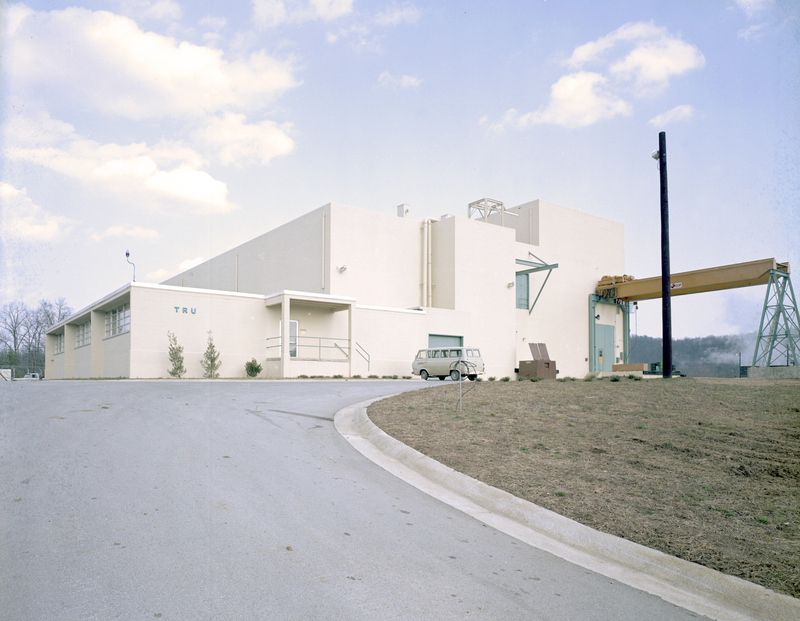 REDC joins the Graphite Reactor, Tower Shielding Reactor, Oak Ridge Electron Linear Accelerator, Molten Salt Reactor Experiment, Radiochemical Processing Plant, and HFIR as ANS Nuclear Historic Landmarks at ORNL. ORNL is managed by UT-Battelle for DOE’s Office of Science. DOE’s Office of Science is the single largest supporter of basic research in the physical sciences in the United States, and is working to address some of the most pressing challenges of our time. For more information, please visit https://science.energy.gov.